Skydiving being the most blissful experience you will ever have, IndiZil tours organize a one day trip to Boituva, the largest skydiving place in the world. Situated around 100 km from Sao Paulo city. Various options of skydiving with or without an extra person jumping to shoot. 5-10% discounts on IndiZil travellers. 140 brl is just the Transportation fee to Boituva. Skydiving charges varies from 300 brl to 700 brl per head based on the type of skydiving you prefer.You will be paying the entrance fee directly at the skydiving company. Fifteen minutes of instruction and you'll already be able to do a jump with the instructor .Instructors, professionals with extensive experience, take full responsibility of the jump. You will only worry about having fun flying in the clouds. The Jump is performed at 12,000 feet (3,600 m). 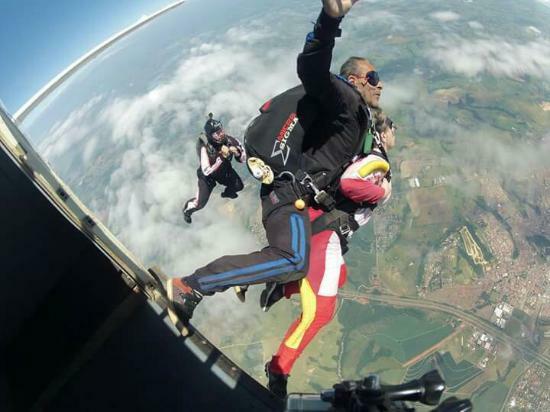 Student and instructor jump from the plane and begin to feel the pure emotion of the free fall, reaching in a matter of seconds a speed superior to 200 km /h. After approximately 45 seconds in free fall, at about 1,500 meters high, the instructor will trigger the parachute.From this moment you will enjoy a few minutes flying, enjoying a stunning and unique look. Indian guide with English/Hindi/Portuguese proficiency. Guide will be with the visitor from the pickup time till the drop. 0% for cancellation before 30 days of the trip schedule date. 25% for cancellation between 7 and 30 days of the trip schedule date. 50% for cancellation between 1 and 6 days of the trip schedule date. 100% for cancellation within 24 hours of the scheduled departure. In 2017, Indizil was born with a mission to redefine the image of Brazil in the hearts of the tourists. We hop miles by taking the roads seldom travelled and destinations that are less explored.